I woke up nice and early this morning and one of the first things I do is check my emails. I had a update from Simply Less is More announcing a new challenge for this week. This time suggesting that we follow a sketch. This is a lovely easy one and a great way for me to continue to use up some more of my stash. I had several images ready to adhere to a card and as I had several embossed base cards ready to go I decided to use two of my stash and thus not a square card as per the sketch. I hope I still qualify. As you can see I have an embossed side on the card. It was done so long ago I am not sure what I used on my cuttlebug but I think it was from a Fiskars plate. Nearly all my stamps were once wood mounted and when I unmounted them I didn't take any not of which company they belonged to so I can rarely give the company credit for such. The little Bethlehem square looks like I have saved it from a previous Christmas card & thus I am recycling and reusing. I hate to see things get thrown even into the recycling bin if I can use it I quite often will. It is something I love to do and feel I am helping the environment a tiny bit as well. 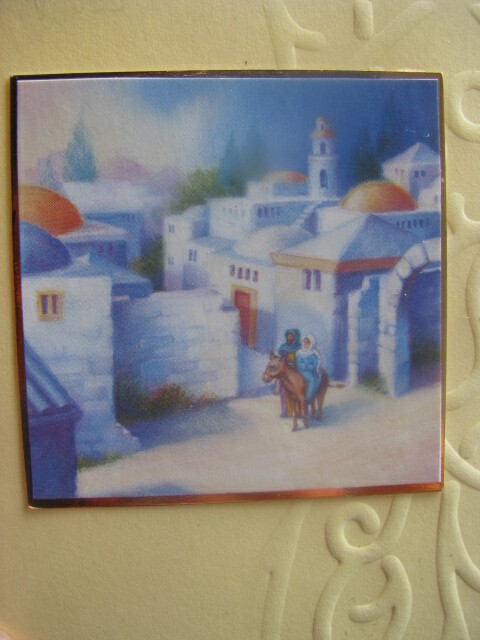 Here is a close up where you can see a bit more of the embossing detail as well as Joseph & Mary and the copper gloss card I had layered it on which also came out of my stash. I feel quite proud of the inroads I have made into my piles of stash. While everyone was still sleeping, I took the opportunity to whittle it down some more. I made 12 all up, but three of them are exactly the same. I will be back after I take some photos of them. I'll be back real soon within 24 hours I hope, to show these to you! Rectangular is just fine Michelle, and your card is great! What a good fortune that you had some things prepared which suited the challenge! A lovely Christmas card - and it's so nice to be able to recycle Christmas cards too! It's very pretty! I like to recycle nice xmas cards, I can see why you saved this one. Lovely idea to emboss the background. 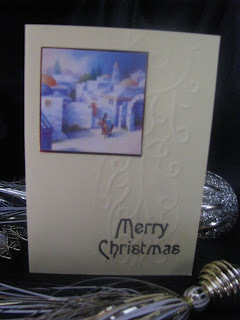 I save my old Christmas cards too and try to recycle. Makes an awesome card!! Lovely card and it always feels good to use up stash, doesn't it!